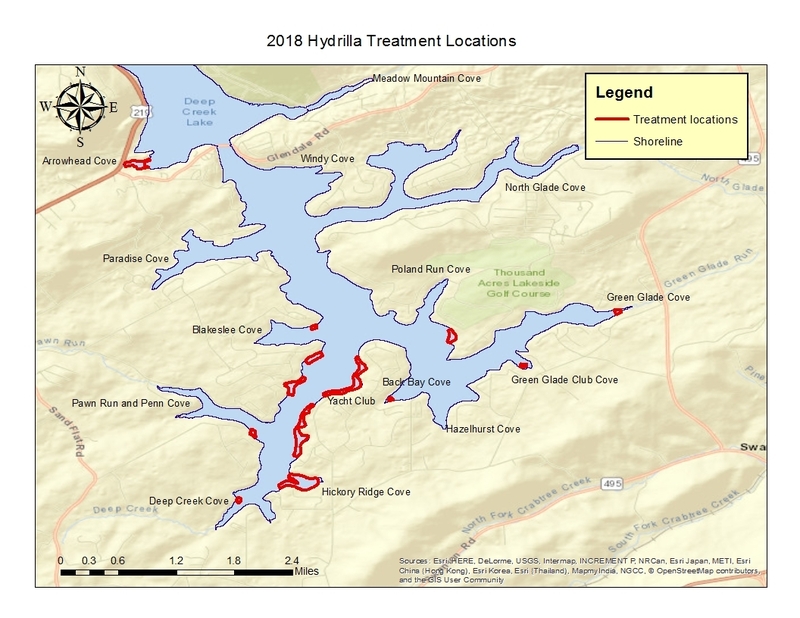 Due to storms in the forecast, the third of four Deep Creek Lake hydrilla herbicide treatments has been moved from Tuesday July 24 to Thursday July 26. The proposed date is always subject to change due to changing weather conditions. During the process, boaters are asked to stay clear of the treatment boat while underway, so that the proper dosage of herbicide can be administered. Additionally, dive teams will be on the lake periodically throughout the summer monitoring hydrilla and response to the herbicide. If you see red and white dive flags, please stay at least 100 feet away, as divers are in the water. Follow-up emails will notify you of changes to the proposed date. We will provide as much advance notice as possible, but please understand that changes can be made up to the last minute due to unforeseen circumstances and changing weather conditions. The map below shows the areas of the lake, outlined in red, that will be impacted by the herbicide treatments. The locations and overview of the 2018 treatment plan can also be found here. Please email Mark.Lewandowski@maryland.gov with any questions on the hydrilla control program.